Are you a user of SchoolSpeak, the complete school management solution? Try out our new iOS App. You will need your SchoolSpeak user id and password to access the App. 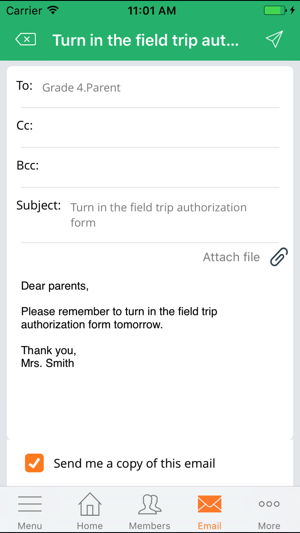 Using the App you can access the same content available on your SchoolSpeak web portal – announcements, calendar events, homework, grades, report cards, lunch ordering and other features enabled by your school, but in a whole new way. 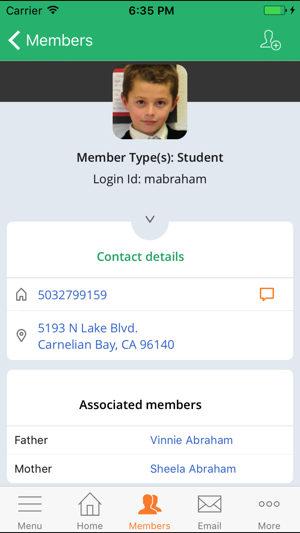 SchoolSpeak App can be used by multiple users on the same device, for example, students can use the App on a parent’s iPhone – each user will login to the App and set up a PIN for quick and easy access. App will require a Wi-Fi or mobile data connection to the Internet for logging in and updating content. Please note that using the app on mobile data connection may cause additional charges. App provides you the option to disable mobile data use. App can retain an offline record of some of the content available online, such as calendar, announcement, homework and member list, on the device, and you will be able to access it even when the device is not connected to the Internet. Imagine accessing your school calendar, announcements and member list on a plane trip. 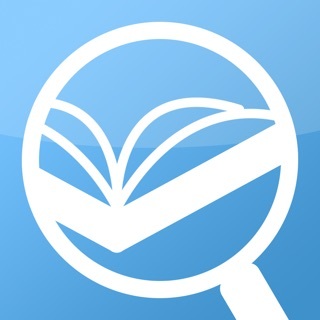 This app is for receiving information on your SchoolSpeak portal. We will be adding edit functionality in the future revisions. We are excited to hear from you and incorporate your feedback in future releases. Please take a moment to send your comments and suggestions to feedback@SchoolSpeak.com. >> Who can use it? Users need SchoolSpeak user id and password to access the App. >> How does SchoolSpeak work? SchoolSpeak brings all solutions for schools under a single login - online communication, student information, secure portal, attendance, grade book, report cards, homework, announcements, calendars, email, text messaging, lunch ordering, online store, payments, online emergency forms, volunteer signup, emergency notification and more. Any user of SchoolSpeak can login to App using his/her SchoolSpeak login id and password. Upon successful login, user is presented the home page where all information relevant to the user is organized in a concise and logical manner. 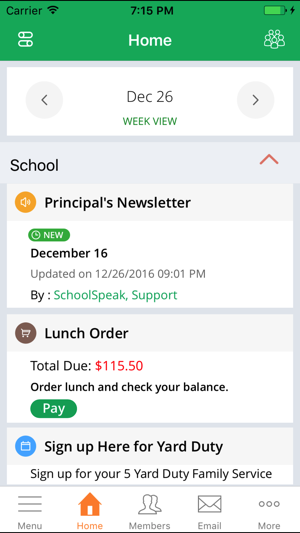 SchoolSpeak App is organized into 5 tabs - Menu, Home, Members, Email and More. Menu – Access any information quickly. Quickly navigate to the item you are looking for. 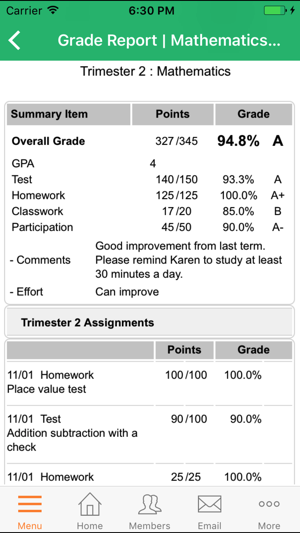 Use this to view latest grades. Home – a concise and organized view of all information relevant for today or the date range selected. Members – list or lookup anyone in school. Click on a name to view contact details. Click to email, phone or text. More – provide feedback, contact school, view all calendars, change PIN, update App content etc. >> What features are included? App currently supports viewing content and emailing. Edit functions will be provided in the future releases. 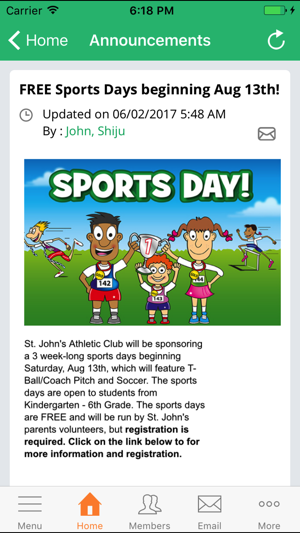 * View all information on SchoolSpeak - announcements, newsletters, photos, calendars, homework, grades, report cards etc. * Access member directory. Look up the person and click to talk, email or text. * Offline access to some of the data when not connected to Internet. * Setup multiple users on the same device. ** Features should be enabled in the SchoolSpeak account by administrators for it to appear in the App. >> Want to contact us? We’d like to hear from you. Please send any feedback or questions. We are always trying to enhance your experience on SchoolSpeak app through new features and improvements across the product. 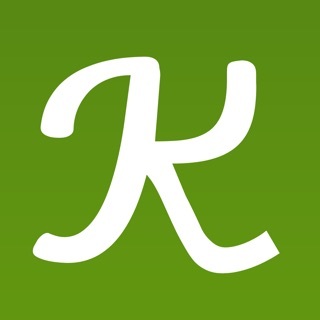 Like the app? Rate us! Give us your valuable feedback using the More->feedback option in the app. This app is great! However, when looking at absentees you have to search by week. Can this be a year or semester thing? There are certain things that make it hard because you can only view a week at a time. Not just the absent days. App was awesome. Mimicked the web version perfectly.. now with the update I can’t find all my kids grades, the school handbook etc... it’s all just current stuff. And once you view it.. it goes away. The app is fairly easy to use. However, I miss announcements because I forget to check it everyday. It would be very helpful if the app gave notifications when there was a new announcement.